If Utah claims the best snow, then Colorado claims the best resorts. Drive west from Denver along Interstate 70 and you’ll pass one world class ski resort after another – Heaven for any snow lover. Our best skiing trip ever, absolutely amazing! Steamboat ski resort has 165 trails spread over 2,965 acres. Fourteen percent are classified as beginner level, 42% as intermediate, and 44% as advanced. So, something for everyone can be found here. Often voted Colorado’s best ski resort, and a second day here will help you find out why. Drive down to the high-class ski resort of Beaver Creek. 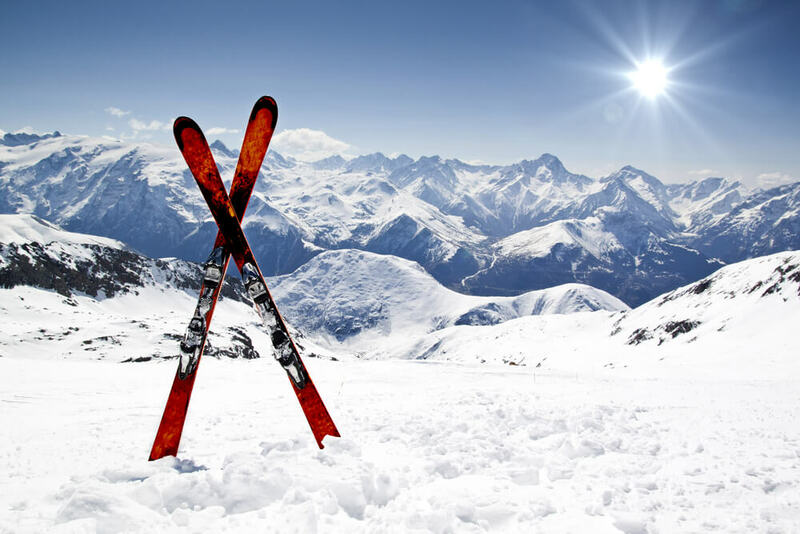 Once you’ve settled into your new hotel you can rest up or hit the slopes, the choice is yours. Nearby Avon, offers even more dinner options along with a cinema. Beaver Creek might is one of Colorado’s most exclusive ski resort. The ski runs often pass millionaire mansions perched on the rocks, and the facilities are all A1. A great place to live life to full or if your wallet can't handle it just mingle with America's wealthy. Vail is close by and is rumoured to have Colorado's best powder snow, in a resort modelled on the Italian Tyrolean villages. Interstate 70 offers more amazing ski options can be enjoyed from your current base. 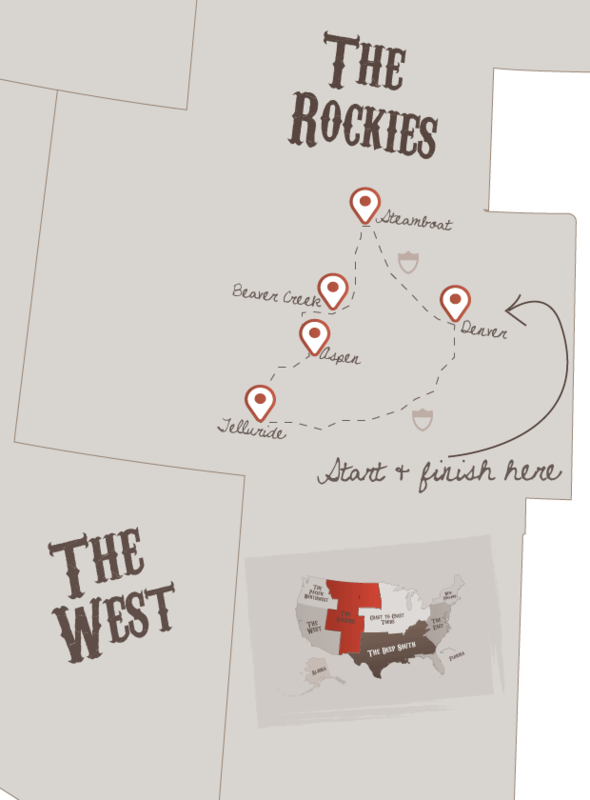 It’s an easy drive to Vail, Breckenridge, Copper Mountain or Keystone Ski Resort. Feel free to enjoy yet another resort today, before taking the drive over to glitzy resort Aspen. The winter home of the rich and famous still maintains a certain small-town feel, despite the chichi restaurants, designer shops and the odd celebrity. From late November to late April one can enjoy 4 different mountains, each with world-class skiing. Another day skiing with the rich and famous. For a great breakfast in a charming setting, why not visit the Main Street Bakery and Cafe. Charged with carbs, you’ll be able to hit the slopes with gusto. Telluride is the favourite ski destination of the team at The American Road Trip Company. It’s a lovely scenic drive all the way from Aspen to Telluride and as ever your Itinerary Pack will show you the best roads to take along the way. Colorado’s most scenic alpine resort was previously a wild west mining town best known as the place where Butch Cassidy robbed his first bank. The mountains are more craggy and dramatic than in other areas, and the town more than matches its surroundings in the beauty stakes. Many A-listers have chosen Telluride as the destination for a second home, and it's easy to see why. Skiing for all levels, stunning natural beauty and a town packed with charm. The mountain in Telluride truly offers something for everyone. Well groomed slopes or fun moguls, the choice is yours. Skiers and boarders of all abilities also get the chance to explore the summit of the mountain, offering views normally reserved for only the ablest of skiers. The biggest driving day of your skiing tour so far. And there are many scenic routes back to Denver, the quickest is along I-70 and it will allow the most time to explore Colorado’s capital. Often ignored as people fly in and rush off to the ski slopes that lie nearby. The “Mile High City” can entertain with good restaurants and bars in the evenings, whilst in the day you can enjoy museums, parks and a zoo. The American Road Trip Company we usually try to book a late flight back to give you more time for fun and so you can sleep during the flight home. So, spend the morning checking off one more Denver sight or finish off any last minute shopping before returning the car at the airport and taking your flight home. Don't forget to check out this road trip's Itinerary tab to see more amazing pictures from our 'Ski Colorado' tour. You'll also be able to read a little bit about what you'll be getting up to on each day of this incredible road trip adventure.